40 Projects for Holloway Company Inc.
9 Reviews for Holloway Company Inc.
Holloway Company designs and builds complete, high quality outdoor living spaces. Their luxurious aesthetic and knowledge in outdoor design is unparalleled. 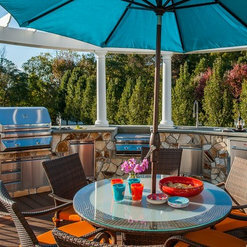 They have done impeccable work incorporating our grills and accessories into their clients outdoor living spaces. We highly recommend Holloway Company to anyone who wants to upgrade their outdoor space or extend the capabilities of outdoor living. As a photographer, I'm in the unique position of chatting to clients about their finished projects. Without exception, Holloway's customers have been delighted with Ted and his crew. 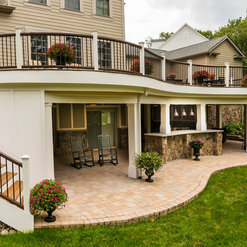 Their finished projects are lovely, livable and add a new dimension to outdoor entertaining and enjoyment. Check them out! 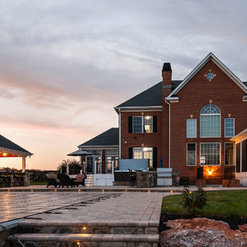 Avalon builds over 15 interior remodeling projects every year throughout the Loudoun County area. My crew has "crossed paths" with Holloway crews on several occasions at our clients' houses, when we are working inside, and their guys are working outside on a patio or paver project. Have noticed the Holloway crew is always neat on the job site, creates some pretty cool walkways & patios, and our clients talk highly of their exterior work. 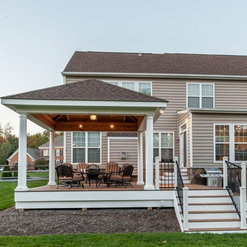 Holloway recently completed a screened in porch with easy breeze windows. The team was extremely professional and took the time to learn our goals related to our outdoor living space. They were extremely patient during the design phase and developed a living space that was even better than what we imagined. Their attention to detail is excellent and the work is all done to perfection. 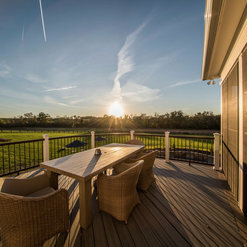 Excellent deck and patio combo! 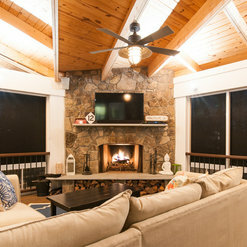 Added a full fireplace as well and could not be happier with their service. Landscape work was great too. We don't typically do a lot of reviews, but having just completed a project with Holloway we had to share our experience. 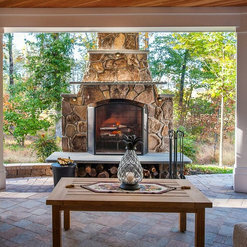 We just finished an outdoor project (patio, fireplace, kitchen, pool deck, pergola, boulder walkway) with Holloway and the product they delivered was incredible. 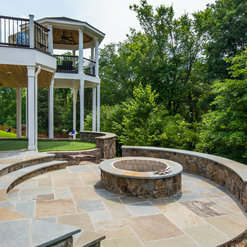 My wife and I interviewed several contractors in the Northern Virginia area and this is why Holloway stood out: - We wanted a contractor that could show us previous projects with the hardscape items we were considering and projects that demonstrated their ability to do something above and beyond the basics. All of the rest of the contractors had 1 or 2 showcase jobs and the rest basic work. 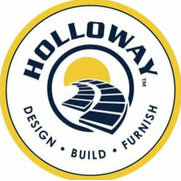 Holloway had dozens of jobs that showed the items we were looking for and every single one of them were elegant, amazing, and blew away the showcase jobs of the other contractors. - After completing several home projects, we have learned that good communication is one of the most important characteristics to look for in a contractor. Ted and his team were always accessible and the communication was outstanding. Questions were answered immediately and there was never any wondering when the crew was going to be there or how long the project phases would take. Everyone involved in the process was always accessible. 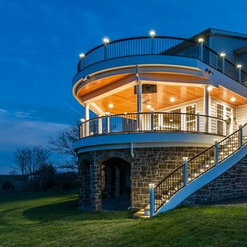 - Ted and his crew completed everything on time, on budget, and went above and beyond to tweak our design along the way to continuously improve it throughout the construction process. They could see 10 steps ahead how certain aspects of the project would turn out and made recommendations that made every single aspect of the project beautiful. With literally dozens of design decisions to make, trusting in Holloway's recommendations left us loving every single element of the project and without a single regret. Words cannot express how completely delighted we are with the outdoor oasis that Holloway has created for us. What we have learned from this process is that this is an investment you are making and it's not worth risking your project with a contractor who will TRY and create something elegant for you. Every Holloway job we saw both in pictures and in person was elegant and amazing. If you select Holloway, you absolutely WILL get something exceptional and will not be disappointed. Holloway Company completed a custom TREX deck (patio style) that my wife designed - a curved shape with modern style. We enjoy it immensely. We chose the Holloway Company to execute the largest home impvoement project that we have ever undertaken. 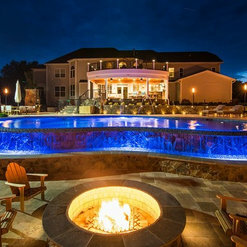 This invovled a hardscape (deck, patio, dry space, outdoor kitchen, fireplace, etc) including integrating our existing in-ground pool. Ted and team delivered on time and on budget with considerate, professional, experienced personnel. The team's ability to go "end-to-end" on an effort like this with no surprises and no complaints from neighbors removed a huge amount of stress and anxiety. This group delivers high quality and creativity at a very competitive price point. We have reccomended Ted to others and are already planning future phases of work. 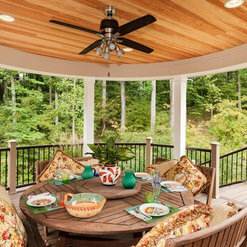 Holloway does not build just decks, they build outdoor living spaces. They were always very professional, neat and quick to respond to concerns. Ted created a very functional yet artistic out door area that I love to show off....its just fun. if you use them you will not be disappointed. 1 Ideabook for Holloway Company Inc. Commented: What does, full EPDM 100% dry space under deck, mean? Thank you!The deck is built at act as a room for space below . Commented: Is the compass rose a kit?Yes it is. Commented: I love that shade of blue on the roof of the outdoor kitchen!They are normal grey shingles but the settings used for a dusk photo shoot emphasize the blue hues of the final photo. Commented: I need ideas to decorated my houseHome decoration is not a service we provide. My best suggestion would be to contact a local interior designer. Angies List is a great starting point.